Interesting souvenirs from travel destinations can be used to personalize any space. In this two-bedroom condo in Makati, pieces from the homeowner’s work-related trips to Afghanistan, Jordan, Amman, and Africa remind him of breathtaking sights and unforgettable experiences. Made from natural materials and designed to have an earthy, organic feel, these furniture and furnishings also add international appeal to the bachelor pad. For interior designer Frenjick Quesada of Design H+Q, the challenge was to draw inspiration from the homeowner’s favorite finds like the towering Afghan cabinet, colorful rugs, and cardboard cut-outs of cities from Japanese brand Muji. Aside from highlighting the beauty of these items, he explains that he had to find perfect pieces with the right color, textures, and patterns for an eclectic vibe. He shares that eclectic style can be compared to improvised acting – there is no script and you complete the look as you go along. 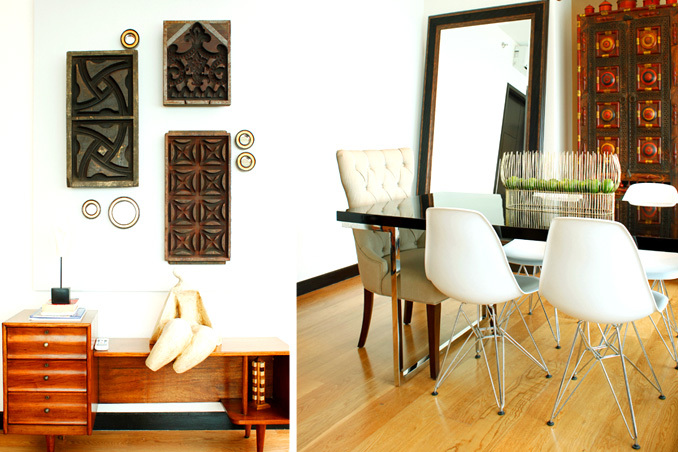 Using this design theme has resulted in a charming space with effortless style. Original article by Kathleen Valle. Pictorial direction by Dagny Madamba. Photographed by Miguel Nacianceno. Read the original article ("Out of Africa") in the August 2011 issue of Real Living Magazine. To download a digital copy of Real Living Magazine, visit Summit Newsstand at https://summitnewsstand.com.ph/real-living.